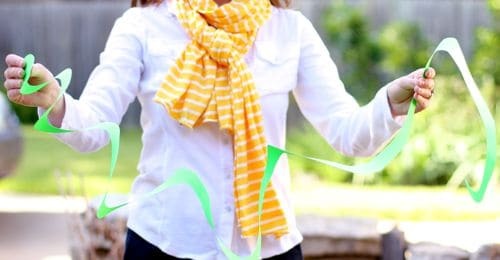 To decorate your party with big impact and low budget, you can make your own party decorations using sheets of paper cut into spiral streamers. 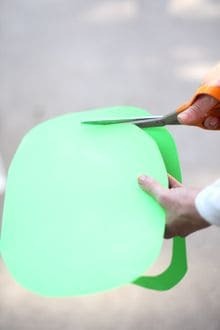 Take a sheet of heavyweight construction paper or card stock (8.5 by 11 inches is fine) and use scissors to round off the corners. You could start with a perfect circle by tracing a plate, but perfection doesn’t matter, and it requires an extra step that doesn’t make a difference in the end result. Just quickly round off the corners so you will start with a rounded rectangle or a rounded square. Then start cutting the spiral. 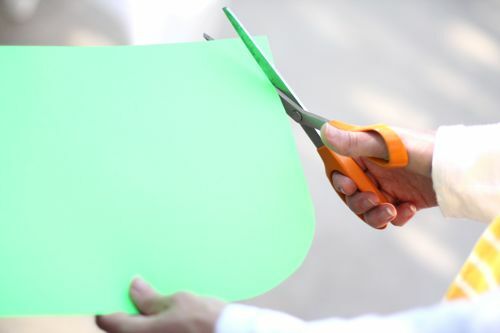 Begin from the outside edge and start cutting a strip about one inch wide. Work your way around making a long continuous spiral until you reach the center. 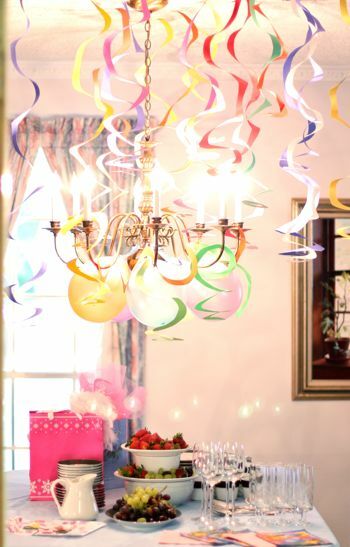 A sheet of paper will make a spiral several feet long that you can hang from the ceiling or drape from the chandelier. This is a great idea and so easy to make. You can also recycle empty plastic soda pop bottles into spiral hanging decorations. 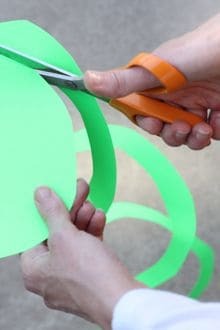 By using the straight sides of the bottle, you can get a very long spiral or you can cut it in half or even three to four pieces to make a spiral bunch. Did you tape the ends to the ceiling? My teen made a bunch of these & taped them in groups to the ceiling all around our family room for a party…we liked them so much we left them hanging for a long time…until they became too dusty. They are so cool. Nicole – yes, we just used little pieces of tape. Thanks for sharing! I linked to this post in my Glow Party series.